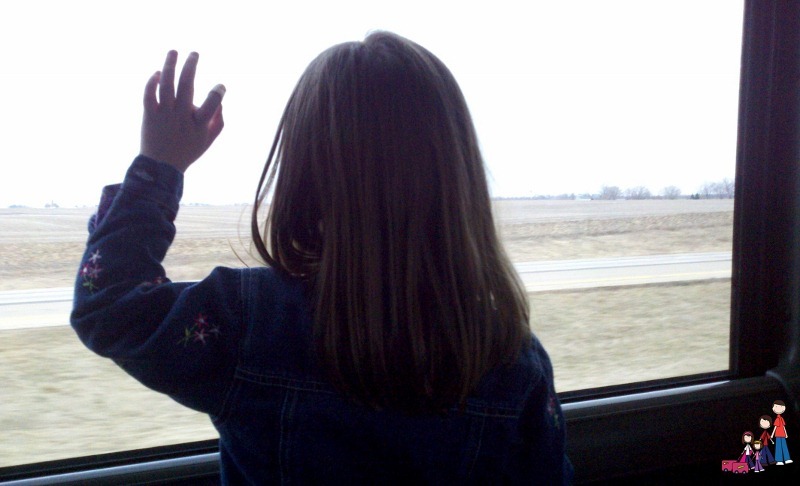 You are here: Home / Travel / Driving / Should I Ride MegaBus with Kids? I’ll cut the suspense and begin the article with a resounding YES! My family recently traveled from Des Moines to Chicago on MegaBus and found it to be convenient, affordable and relaxing. In the Midwest we are very used to seeing two type of buses on the interstate- the charter bus filled with seasoned travelers and the bus with the dog on the side- neither of which is really an option for family travel. Then, last summer, the bus “with the fat man on the back” began rolling through the Heartland of America. MegaBus picks up passengers at a bus-stop in downtown Des Moines. City parking is nearby and affordable. Buses depart at 8am and 5pm. If you are traveling with kids I suggest the early departure as arriving at Union Station in downtown Chicago at 11pm could prove a bit nerve-wracking. 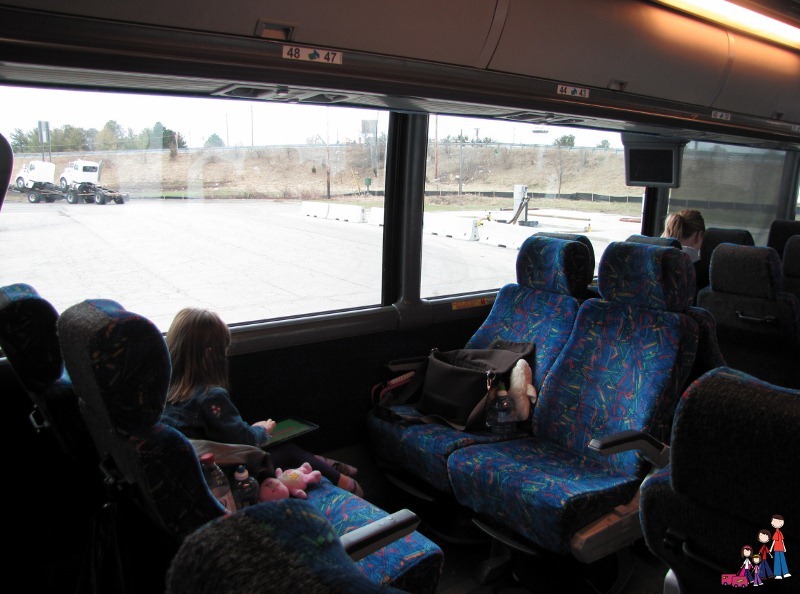 Unlike the bus with the dog on the side, MegaBus makes two stops on it’s route to Chicago; the second in Iowa City to pick up and drop off passengers and one in Utica, Illinois for a quick rest stop. Because of the limited stops MegaBus gets you to Chicago in about the same time it would take to drive yourself. The girls were very excited to ride a “real” bus. Being suburban girls buses seem like a magical form of transportation- and one they never get to use. Unfortunately we didn’t get a double decker- but that disappointment was soon forgotten as we settled into four seats that faced each other and sat high enough to look down into semi cabs. The seating was ideal for my family of four. With a child opposite each of us, Doug and I had plenty of leg room. In fact, I leaned my seat back and stretched my legs, feet resting in the seat across from me that my daughter was only partially using. As we left Des Moines our driver, Dennis, gave us a humorous rundown of the rules and the disclaimer “If the outlets or wifi don’t work, don’t tell Dennis- there ain’t nothin’ I can do about it.” Thankfully our outlets did work- and so did the wifi (while we were near cities). Dennis proved to be a driver with a sense of humor, popping over the microphone with little pearls of wisdom, “Our cruising altitude is currently ground level and our speed is around 70 miles per hour”. Most of his quips ended with, “MegaBus- the bus with the fat man on the back, not the dog on the side”. He said it so often that my girls were filling in the end of his sentence before we hit the border. My family settled into the ride easily, with the girls looking out the window much more than they ever do when riding in the car. When they tired of that they would talk with us, color or just curl up by our sides and relax. 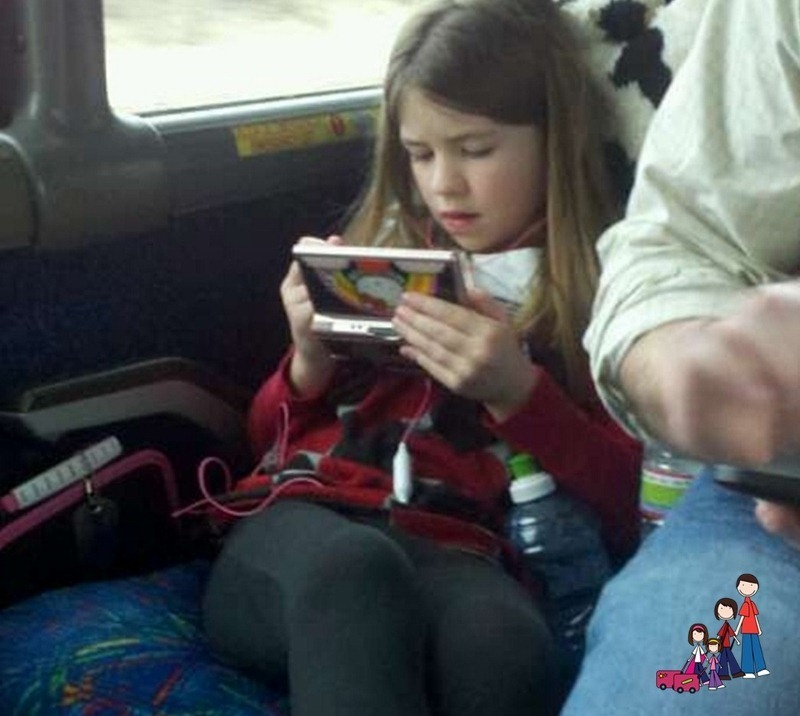 Handheld games did make an appearance- on our ride home. I guess that after a weekend of family time even they needed an escape! Each 6 hour ride passed quickly; not once did we hear “Are we there yet?” or even a hint of whining. Apparently bus rides are enjoyable for the entire family! The cost of our trip was $223- or about the cost of one plane ticket. Fares are sold one-way, and you can often find sales. The bus has a bathroom. It’s kind of like using an airplane toilet during continual turbulence. There is no sink in the lavatory, but hand sanitizer is available. I suggest bringing baby wipes. Check to see how many stops your route has and where. If a stop is for pick up/ drop off you won’t have time to run for a meal. Pack a snack. But be careful if you pack carbonated beverages. The seats are very comfortable, but the ride can be bumpy. Yet another use for those baby wipes! Outlets are available near every seat. Don’t forget to unplug- you don’t want to leave your cord! Seats recline, but bring a jacket or small pillow if you want to relax- the edge of the bus is quite hard. But mostly, relax and enjoy the ride! This was the first roadtrip that my husband didn’t arrive at our destination exhausted! Disclosure: Family Rambling would like to thank MegaBus for our round trip transportation from Des Moines to Chicago. All thoughts and images (except noted) are my own. We’re participating in SixSuitcaseTravel’s Family Travel Friday Blog Hop. Follow the hop to discover more great family travel writers! Good to know! 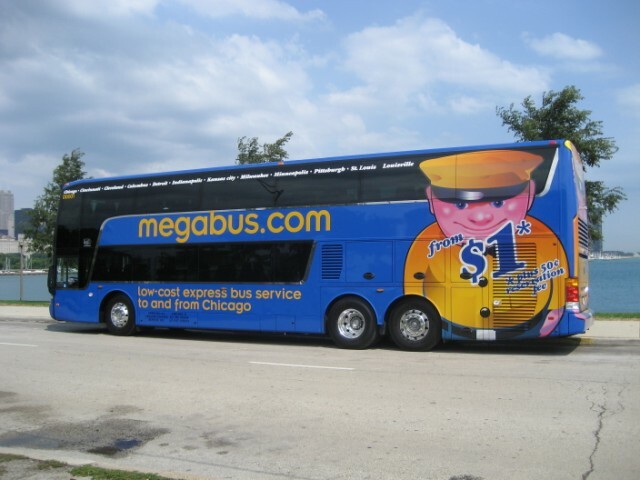 I’ve yet to ride MegaBus but now I won’t hesitate to bring our daughter if we decide to. I hope your family had a blast in Chicago, too! We have never taken a bus trip, however, we have traveled twice by train recently – once in Europe and once here at home – and the kids loved it! No lineups to check in or for security at the airport, no seatbelts, freedom to move around – probably the easiest travel we have ever done.